Generating an estimated $7-23 billion dollars each year, the illegal wildlife trade is the world’s fourth most lucrative criminal enterprise, after the illicit trafficking of drugs, humans and arms. This staggeringly widespread trade is undertaken by organised criminal gangs, is highly sophisticated and is putting the future of over 7,000 known species at risk of extinction as well as threatening the effective functioning of entire ecosystems. To combat this trade, the Convention on International Trade in Endangered Species of Wild Fauna and Flora, or CITES, which emerged from a resolution adopted in 1963 by members of the International Union for the Conservation of Nature (IUCN), went into effect on 1 July 1975 with an initial nine members. An international agreement to which states voluntarily adhere, CITES now comprises 183 Parties, including the Government of Sri Lanka which in 1979 became the 49th nation to join. The purpose of CITES is to ensure that the international trade in wildlife does not threaten the survival of traded species. Currently there are over 35,000 protected species for which CITES has developed international trade rules. It is important to note that CITES deals only with international trade and therefore does not apply to illegal harvest of wildlife nor illegal domestic trade. A key part of CITES activities is to record international transactions which have gone from almost none in 1975 to 1.2 million in 2015. The structure of CITES is such that there are three Appendices on which species are listed according to level of threat and extent of trade. Appendix I is for species threatened by extinction and trade in these species or their parts is banned except under exceptional circumstances. Appendix II is for species that may not be threatened with extinction but ensures that trade is controlled such that it does not start to impact species survival. Appendix III is for species that are protected in at least one country, with that country having asked CITES Parties for help in controlling trade. Since inception, the leopard (Pantherapardus) has been listed on Appendix I of CITES (where trade of any form or part of the animal is banned) due initially to the high demand for its skin.An important step in reducing the threat to leopards by the skin trade has been the adoption of faux leopard skins for use in traditional ceremonies, particularly in Southern Africa where it has been estimated that ~2,500 leopards were killed annually to service this market. The Nazareth Baptist (Shembe) Church alone was estimated to utilise ~15,000 illegal leopard pelts in their ceremonies. The provision of faux furs was the initiative of the Panthera organisation in 2013 and is showing strong signs of success.This follows on from an earlier initiative in Tibet, where until 2006 Asian big cat skins (tiger, leopard and snow leopard in particular) were widely used to decorate traditional costumes called “chupas”. In 2006, local religious leaders successfully appealed to reduce this practice. While the market for leopard skin has declined in some areas, it has certainly not disappeared and according toWorldWISE and the IUCN RedList between 2005 and 2014,over 1,000 leopard skins have been seized around the world, with over 500 of these in Turkey, followed by India, China and the United States. It is still the most trafficked big cat in the world for its skin. Sri Lanka does not appear high on these seizure lists – although one skin was seized in January 2011 in Colombo –butit is essential that authorities remain vigilant here as well. A valuable reminder comes from 1982 when 11 leopard skins were detected and confiscated in Sri Lanka by the Biodiversity Protection Unit of the Customs Department. The skins had been concealed in the false bottoms of wooden crates exporting gramophone cones. Of course it is not only the skin trade that impacts leopard populations, with the species now further threatened by the trade in other parts including claws, teeth and bones which have been used as substitutes for tiger bone for the Asian medicinal market. One particularly large seizure in Delhi in January 2000 resulted in the confiscation of 70 leopard skins and 18,000 leopard claws which represents ~1,000 leopards; which is what we estimate as the total adult leopard population in Sri Lanka alone. The origin of trafficked species is difficult to ascertain but increasingly sophisticated DNA analysis techniques are starting to provide answers to this question as well. 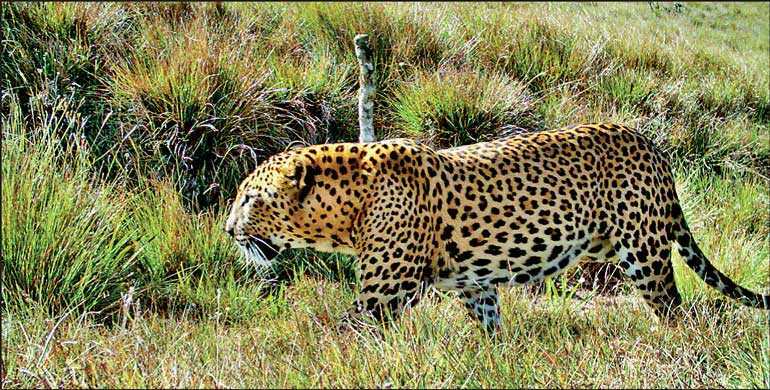 Poached leopards in Sri Lanka – including those killed inadvertently in snares set for other wildlife – haveroutinely been found without claws and teeth, and even paws and entire heads, suggesting a domestic market in leopard parts at the very least. Another local market exists around leopard flesh, with some areas holding traditional beliefs that the neck of a leopard, if consumed, can combat asthma. Occasional evidence of leopard flesh for non-medicinal consumption has also been documented. By being a signatory of the CITES Convention, Sri Lanka is armed with a legal framework that can be used to prosecute when and if any leopard parts are detected entering or leaving the country. This is a useful tool as it eliminates the legal grey areas that can otherwise be exploited by wildlife traffickers.